"We're at war… It's a war of perception: the poor kid from Brooklyn against the whole Soviet Empire." Bleecker Street has debuted a full-length trailer for Ed Zwick's Pawn Sacrifice, the long-awaited Bobby Fischer movie, starring Tobey Maguire as the chess champion who went crazy. This movie profiles Fischer during the lead up to his 1972 match against Russian rival Boris Spassky, played by Liev Schreiber, in Reykjavik. The cast includes Peter Sarsgaard, Michael Stuhlbarg & Lily Rabe. 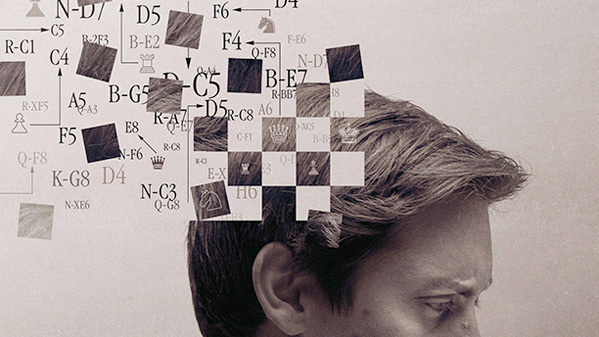 I saw the film at TIFF last year and wrote in my review: "I was fully engaged in Pawn Sacrifice from start to finish, fascinated by the politics and the sport, but also intrigued by Bobby Fischer and his peculiar mind. The who and why…"
American chess phenomenon Bobby Fischer (Maguire) squares off against his Russian rival Boris Spassky (Schreiber) in the 1972 "Match of the Century" in Reykjavik, in this gripping docudrama from director Edward Zwick (Glory, The Last Samurai, Blood Diamond, Defiance, Love & Other Drugs) and screenwriter Steven Knight (Eastern Promises). "It was dubbed 'The Match of the Century,' and it drew more worldwide interest than any chess match before or since. The 1972 World Chess Championship between American challenger Bobby Fischer and the USSR's defending champion Boris Spassky would for several weeks turn a chessboard in Reykjavik into a battlefield of Cold War one-upmanship." The film first premiered at the Toronto Film Festival last year. Bleecker Street will release Pawn Sacrifice in theaters on September 18th. That trailer picture is how we all felt halfway in to viewing SPIDERMAN 3. You made it halfway before feeling like that..? The story of Bobby Fischer is an intriguing one. About time we see a film focus on his greatness and his mental illness. I'm seeing this for Tobey and Peter Sarsgaard.